This should come as no surprise, but the near capacity crowd at FirstEnergy Stadium went home with their heads down again following the 27-20 loss to the Oakland Raiders where the final score doesn’t dictate how by the Browns played as a team. I should know because I was one of those many loyal fans who shelled out money to watch that bad display of professional football on Sunday afternoon, if you can call it professional. 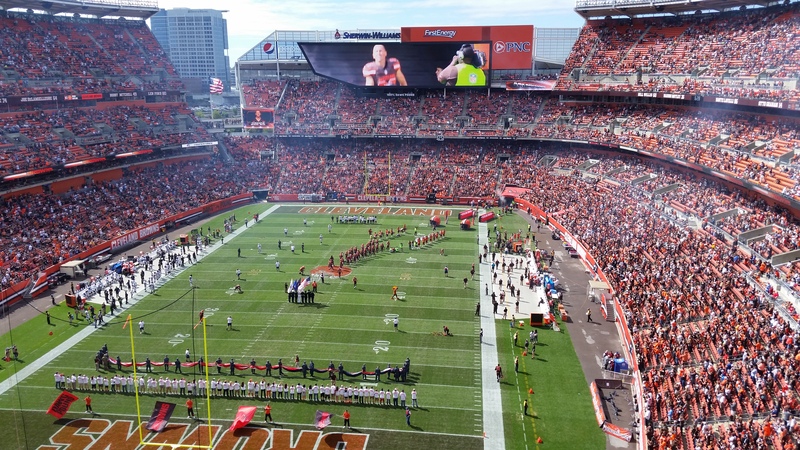 The Browns came out and looked the team that travel over 2,400 miles across three time zones to play an early Sunday afternoon east coast game instead of the team that actually made the trip in the Raiders. It was so bad that the crowd was already booing quarterback Josh McCown in the second quarter. Then the chants of ‘Johnny, Johnny’ could be heard loud and clear throughout the stadium, even though McCown sarcastically claimed he couldn’t hear them when asked about it after the game. “There were “Johnny” chants? 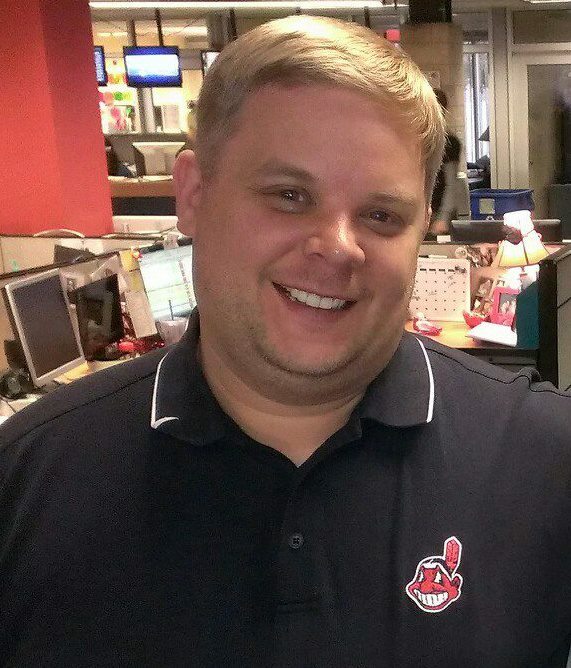 I understand the situation that I’m in and this part of it,” McCown said. “He’s an exciting young player that I know people want to see play. I understand that part, but for me, I have to just focus on where we are and what we’re doing. We had our own problems and our own issues just trying to move the ball and so that’s really where my focus is. 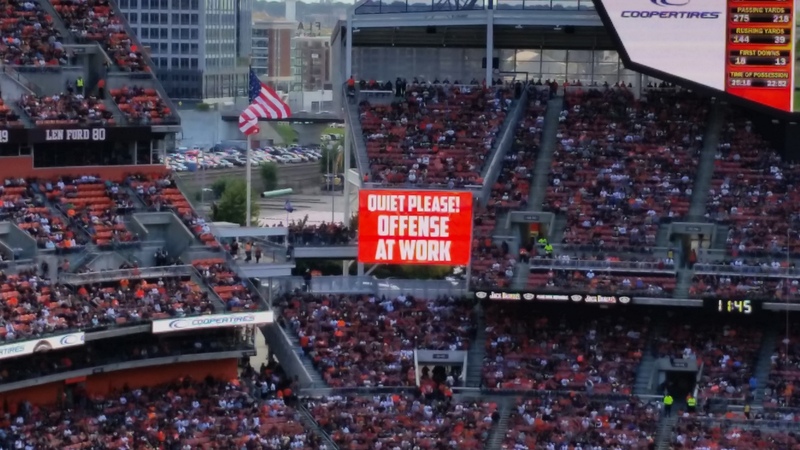 I thought it was pretty funny at the time the fans were chanting the first name of the backup quarterback, the gameday crew who work in the FirstEnergy Stadium scoreboard room posted the ‘Quiet Offense At Work’ graphic at that moment, and many more times throughout the game. My seats were in the new Ford Deck section on the Northeast side of FirstEnergy Stadium right next to the scoreboard above the ‘Dawg Pound.’ The view of the field is terrific, to bad the view of what took place on the field for over three hours was not. Of course, no matter where you sit you are going to hear many armchair and self proclaimed football experts who think they know how to fix all the Browns problems, when of course they don’t. It can get really annoying, really fast, as I tweeted out during the game. Later, those exact same fans I was talking about got so upset after the defense game up the touchdown drive early in the fourth quarter, they threw their partially empty beer bottles on the steps and hit the two ladies that were sitting to my left. I felt so bad for them and I wanted to give them a piece of my mind, but didn’t because I would be stooping to their level and I have more class than that. I just hope those guys aren’t season ticket holders in those seats. The ladies sitting next to me are and can’t imagine how these guys will get if the season goes into the tank. I hope security or game day staff at the stadium will deal with idiot behavior like I witnessed in a timely matter. I understand your frustrated, I am too but keep your cool and don’t ruin the game day experience for others. I know a guy who id working security on game days. If he was in the section I was sitting in, he would have gone out of his way to deal with the problem. Now that one example of fans frustrations has been brought to your attention, what about the concern everyone always has here in Cleveland, the quarterback situation. While most fans won’t like this, the Browns aren’t going back to Johnny Manziel anytime soon. While I was waiting in line and the concession stand to get a hot dog and a Pepsi at halftime, three fans waiting in line with me all ask the same question, will Pettine switch to Manziel in the second half. Of course, you know what my answer was if you have read this article up to this point. My answer was no. I had no idea who these guys are and I certainly didn’t tell them I write for this website and have worked in the Cleveland sports media for the last seven years. Somehow I was the guy they felt had the answer they wanted to hear and then I rained on their parade with a heavy dose of reality. I couldn’t disagree with their reasoning for wanting Manziel to play in the second half. I wanted the Browns to stay with Manziel so they can get an idea of what he can do. The more opportunities Manziel gets, a better evaluation can be made of him especially if you have to use a high draft pick on a quarterback next year. 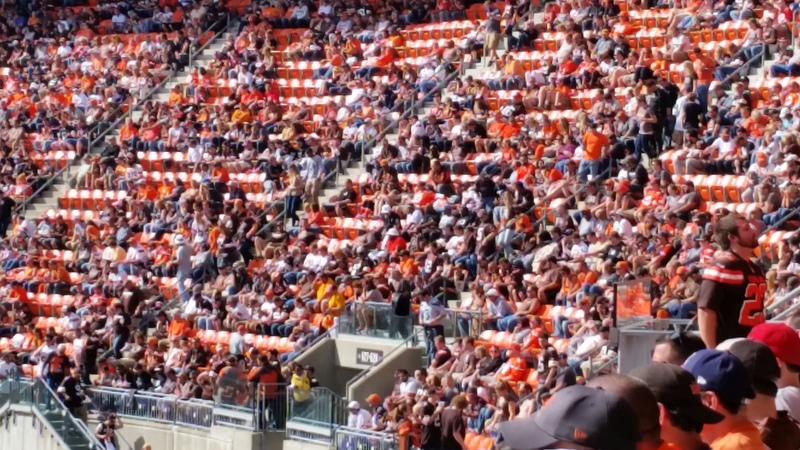 A decent amount of fans sitting in the sections I was in decided to call it an early day when the Browns fell behind 27-10 early in the fourth quarter. 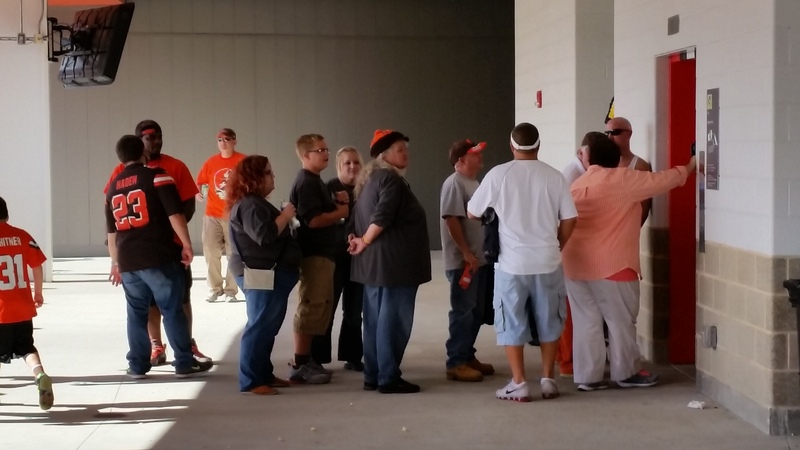 There was still the majority of the fourth quarter to be played and they were lined up outside the elevator waiting to go down to the main concourse and head to the Muni Lot or wherever they parked their cars at and begin the sad trip home following another Browns loss. I wonder what they would think if McCown didn’t get intercepted by Charles Woodson in the final minute of the game and the Browns would have scored the game tying touchdown. I give a tip of the cap to the fans who stayed until the end in the hope of overtime and perhaps a come from behind victory on a day where the Browns didn’t deserve to win the way they played for the majority of the afternoon. The following comment that was posted on my facebook page this afternoon by a friend of mine, not the one who went to the game with me I might add, named Steve sums up the day and the frustrations of Browns fans in general about Sunday’s performance. It wasn’t the birthday present he was wishing for. He’s right the Cavs start soon, as in tomorrow with media day, training camp starts Tuesday.